When it comes to the Uniform CPA Examination, the buck does stop with the boards of accountancy, NASBA Chair Wesley Johnson told the executive directors and the legal counsel attending the March meetings. 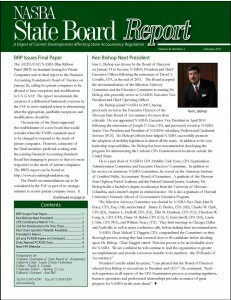 He reported the Committee on National Examination Preparedness, with Diane Rubin as chair, has been charged with increasing the influence of the state boards of accountancy and NASBA in the CPA examination process, and they will be holding a special examination conference early in 2008. They are considering how to deliver an examination in the event something goes wrong with the current delivery system and how the boards should proceed after the current examination contract concludes. Chair Johnson said professional examinations are being offered in other countries. However, he noted that issues of security need to be addressed before NASBA can move forward with this plan, and these are being addressed. NASBA will also be bringing together a panel at the end of April to discuss the framework for education rules, Mr. Johnson reminded the executive directors. There will be a cross section of representatives from the American Accounting Association, the professional associations and the firms to discuss new model education rules for the Uniform Accountancy Act. While the last set of proposed rules resulted in many adverse comments, Mr. Johnson said the positive aspect of that exposure draft was that it brought together many people to develop the rules.